I'm sure you've heard of the seven deadly sins. You know, those pesky little attributes that everyone is supposed to shy away from in order to live a life bound for heaven when we die. Of course, I don't ask you to believe in these things and to each their own, but I ask you to make some connections with me between these ways of life and media as we know it today. We all know that we should try to give in to these vices as little as possible, but media makes it so much easier and attractive to lose our way. Here are some connections I have made between the deadly sins and media-related trappings. As our geography teachers and mothers constantly remind us, there are starving children in Africa! And yet we have so much food in the Western world that we can afford to make grotesque "feasts" out of large amounts of food, not to feed ourselves or to gain sustenance, but for the sole purpose of Youtube views. What a world. Finally, a social place where those who are vain enough to stare at themselves in the bathroom mirror for hours can allow us to do the same! Facebook users have gone out of control with this incessant profile-padding. I don't need to be assured of how "hot" someone is, or how many friends they have, or just how straight they can get their hair with fourteen hours of hot-ironing. And I definitely don't need to know that your so-called "father" is listed on Facebook as your friend named Katie. Unless that is true. In which case, I retract my comment. I don't know that much about these kinds of games, but I have seen firsthand what they can do to your average human male aged 12-40. These are the events that take place (in roughly the same order each time a new game comes out). I have never seen Cooking Mama Cook-Off do this to anyone. JUST A HINT. You have seen them on the newsstands, Better Living, Better Kitchens, Better Cars, etc, why do we always feel like we need these objects that will "make our lives better" such as new blenders or electric foot baths. I dare the people who read these magazines not to buy a single item for a whole day. What a challenge! There are so many advertisements all around us, all because corporations just want to get richer and richer off of our stupidity and lack of self-control. We have advertisements in our movies, email, breakfast cereal, milk cartons, even in places where we don't even know we're being advertised to! Did you notice the iPhone in that picture? 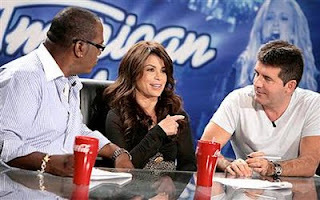 Exhibit B) The judges of American Idol always have Coke glasses (in their iconic shape) in front of them, with the logo just-so partially showing to the camera. This is all purposeful. I have two schools of thought for this one, and they kind of blend into each other. We have all become so incredibly desensitized to violence, whether it be in video games, action films, rap songs or anything else, that when we see violence in real life, we don't even blink an eye. Not only that, but the problem has escalated to the point that we are actually copying the things we see in these violent video games, for example, and we are causing real-life harm to ourselves and others. Furthermore, everything in media has a name-tag attached to it. Everyone wants their credit (whether it is due or otherwise), and we will do anything to get it. That may mean suing others because they came up with an idea that, in some small way, relates to an idea we "say" we came up with first. We feel that we are entitled to some form of the compensation they are earning, things just escalate from there. And, in a horrible mix of these two things, many people are suing video game companies because their children are emulating the things they see when they play the video games. The whole thing has spiraled out of control and I think everyone needs to just calm down. I just don't even know what to do with this. I really like the song. It's good. Don't get me wrong. But this video, what is the message here? I completely understand if you didn't watch it all the way through. I didn't want to. Nothing really needs to be said about the video that you can't glean from watching it, so I'll just leave it alone. Well, there you have it, you now know exactly what to watch out for in these technological days of yonder. I hope you are able to use this handy guide in your daily life, and if you want to know more about the seven deadly sins, you should watch the movie Se7en. It's a great take on the sins as represented in our modern times. Thats some interesting point of view, but I'm not sure about sloth, I'd say is more focused on the webs that do all you have to do for yourself, i.e. look for something, copy, paste, homework ready. That's definitely a true relation to sloth as well! There are definitely more connections than these here. People will always be greedy. Fact. seriously? 15 isnt that overwhelming. Not cool that you photoshopped the iPhone between her breasts. Fail. Actually, I found that picture on Google Images, and you kind of missed the point of the whole post. The picture displays the fact that we see advertisements everywhere and yet we don't even know that we are being advertised to. You are a prime example of this fact, and thanks for proving my point. I hope you have learned something from the post now. Great post, the media is really just... full of it. I love Se7en! Yeah, sloth is such a strong sin right now since everything that is comming up is basically to make "life easier". Victim and representative here! Interesting post, I've actually never considered how "the 7 deadly sins" present themselves daily in the media, and it's pretty staggering. However,(and you might find this interesting... I did) the window licker video was actually meant to just sort of poke fun at/critique modern day hip-hop and rap culture. I read somewhere Richard D. James (Aphex Twin) said that he just wanted to point out how stupidly excessive and misogynistic mainstream rap and hip hop is now-a-days... hence the strange, strange music video. Also... Aphex Twin is just a really weird dude so that makes sense I guess.